I love the weekends and holidays. Not so much for the fact that I don't have to work but more of the fact that I get to sleep in. Otherwise, on a normal work day, it's a 5:30am wake up call for me. Sleeping in means getting up whenever you like or when your bladder can't hold it in anymore. Haha. One of my usual rituals on a lazy Sunday morning is a good old fashion wet shave. Granted the electric shaver does a faster job, which I save for weekdays, I still prefer to keep things old skool when it comes to this time-honoured rite of passage of manhood. The electric shaver does a closer shave since you are not allowed to shave against the grain, lest you risk ingrown stubble. Still, the combination feel of warm water, shaving cream and 3,762 Gillette blades trumps an electric shave anywhere, any time. Another big advantage of a wet shave is the ability to get rid of the "peach fuzz", that the electric shaver can't handle, which has a tendency to trap a lot of dirt. So with a cleaner face, less problem especially when it comes to acne. So there. Done with the shaving. 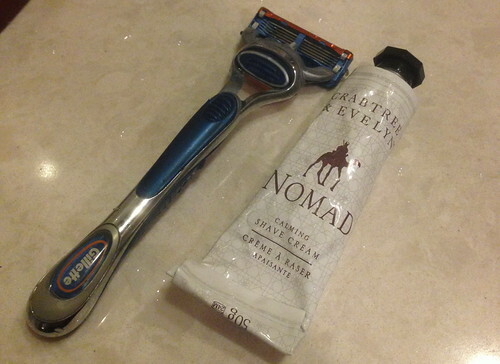 Similar to my weekend and Monday morning shaving ritual, except I use the Mach 3 and the shaving cream that came with it. How often do you change your razor? Arrenn: I don't have a fixed timing for changing blades. My rule of thumbs is that I change the blades if they appear to have a layer of oxidation. Given that I don't wet shave daily, my blades last a long time.